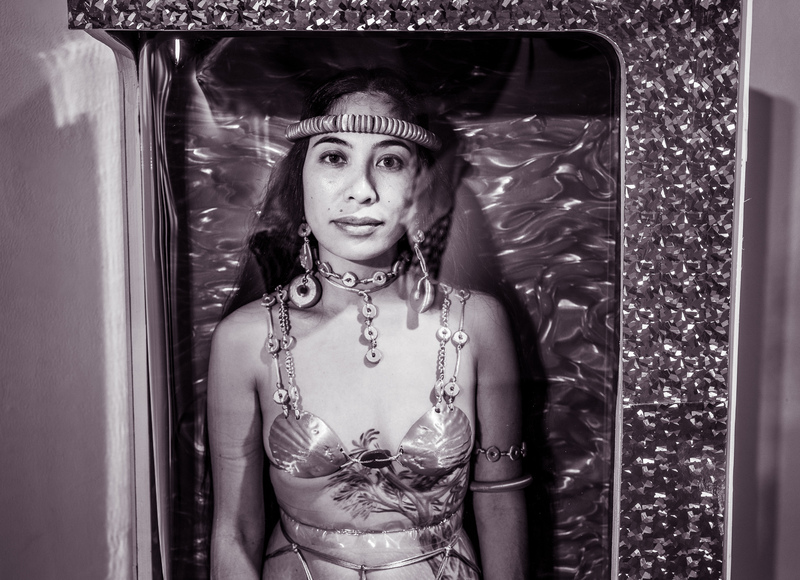 Chamorro artist Lia Gogue presents three new works exploring identity. This body of work encompasses the celestial, the world I inhabit, and the space that’s in between in an intersection of ancient and modern, technological worlds. While producing this work I was thinking about my place in the spaces I inhabit and my privilege (or lack thereof), and the places that I’ve been put into as a result of my identity as a colonized indigenous woman. The fetishization of the other in the history of white-walled spaces follows me around even today. The effects of colonization are evident in my life and my thoughts daily. I am not a Jungle Barbie, but this world wants me to be. After standing motionless for hours, performance artist Lia Gogue breaks into a momentary laugh as I place an offering of Halloween candy around the Jungle Barbie box. This moment brings Vanessa Beecroft to mind. The way Beecroft’s models begin performances in such sharp form, like Salvador Dali in an Andy Warhol Screen Test, and then as time passes they, like Dali, slump into less performative and more authentic moments. Sitting is easy. Walking is easy. Standing is hard. I don’t know how Gogue manages to stand in one frozen moment for so many hours. I’m pretty sure I am not physically capable of doing this. What does Lia Gogue think about for all these many hours in the Jungle Barbie box? In the virtual world Second Life, my avatar built a shipping crate to be displayed in, in a fashion reminiscent of Gogue’s Jungle Barbie. As Lia Gogue considers her colonized identity as a Chamorro, my avatar sought to explore the marginalized identify of avatars. The crate was designed as a replica of the crate that Maurizio Cattelan built to ship his polychrome, crucifixion-like sculpture. The Cattelan sculpture was a 3D replica of Francesca Woodman’s 2D self-portrait hanging from a door frame. 1989 Collector’s Edition Jungle Barbie in mint condition with 3d printed plastic accessories. 69 x 25.5 x 12″. 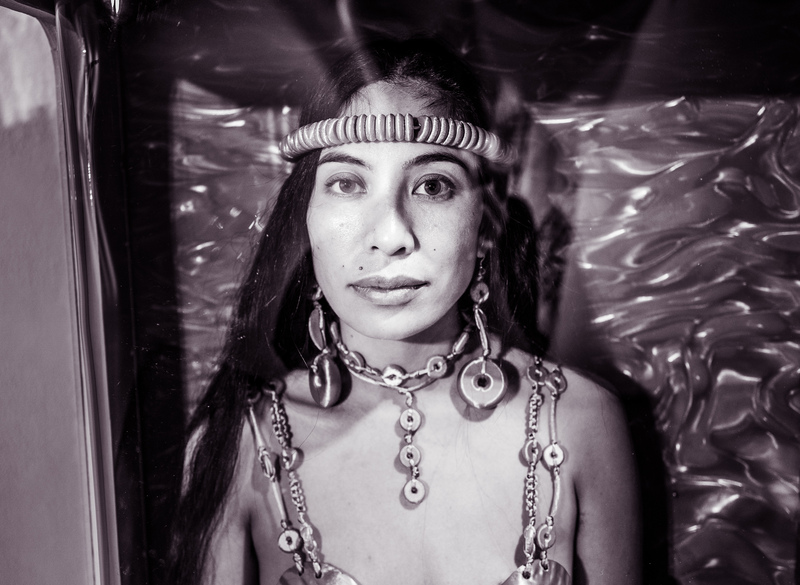 Wood, holographic board, vinyl, 3D prints, polyester, wire, tape, wallpaper, Chamorro woman’s body. 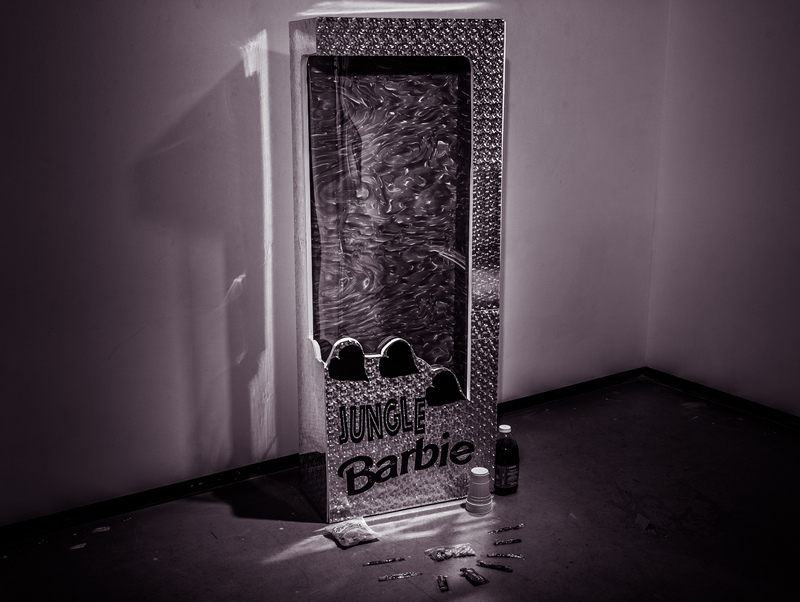 Given Gogue’s statement about white-walled spaces, fetishization, and colonization, it is interesting that her Jungle Barbie is presented in the white walls of the School of Art’s Dutzi Gallery. What if Gogue had colonized space outside the gallery? Perhaps in the SOA Gallery Courtyard? Or some other space on campus? Or in a shopping mall? Would Jungle Barbie in a shopping mall be a pointed critique of colonization and/or consumerism? Or simply a cool photo-location for selfies? In 1989 Collector’s Edition Jungle Barbie in mint condition with 3d printed plastic accessories, Gogue does indeed give this world, give us, what she perceives that we want from her. It is the other two, non-performance, installations in the Dutzi Gallery, Latte Lady lives in Lia (Resistance Quilt) and The things that hold us together that seem to offer her more “celestial”, yet grounded, take on identity, family, and community. Standing in an art gallery in Long Beach, California, and reading Gogue’s self-description as a colonized indigenous woman, one might think about Native American history. We often refer to slavery as the Original Sin of America, and certainly the corrosive effects of slavery have never left our shores, yet perhaps it is the ethnic cleansing of Native Americans by Invading White Colonizers that is the United States’ first sin. Gogue may well feel a kinship with Native American history, but that is not her history. Gogue’s ancestry is as a Chamorro, a colonized indigenous woman of Guam (Mariana Islands). 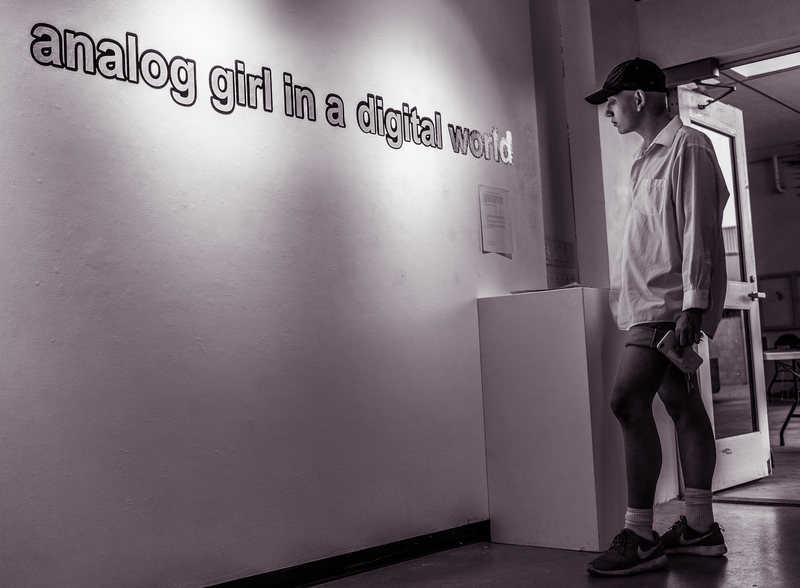 From our own reflections in the shiny plastic window of the Jungle Barbie box to the rich textures of her large fiber-based quilt-collage, materials function as a stand-in for the Digital and Analog, 2D and 3D, Privileged and Colonized, spheres that Gogue invites us to consider. Latte Lady lives in Lia (Resistance Quilt). lasercut pupula leaves from family’s clothing, panadanus guafak, hand painted cotton weaving, fabric, plastic, wool. 7 x 8′. The things that hold us together. Single-channel video projection, fuafak woven of elastic and lace, memories. Multimedia. After taking this picture, I stood, perhaps 24 inches from the Jungle Barbie box and shared an exchange of gaze with Gogue. I don’t know if it was the best way, but it seemed like one way to be present with this compelling, but also cool performance work. Even with a performance work as abstract and static as Cortnee Brush’s Onanist there is a vague sense of temporal trajectory. Here with 1989 Collector’s Edition Jungle Barbie in mint condition with 3d printed plastic accessories I felt that it was less clear how to experience this performance. To simply notice the work for a minute, be amused, and move on, seems inadequate to the intense, durational nature of Gogue’s work. I had already tried sitting on the gallery floor for some minutes when it occurred to me to look closer. To be more present with the performance. It is hard to stare into a motionless performance artist’s eyes without thinking of Marina Abramovic’s The Artist is Present, or her other earlier and simliar works in collaboration with Ulay. In the video clips from The Artist is Present the drama is high. Sometimes it is a woman staring at Abramovic with tears streaming down her face. Other times it is James Franco breaking into laughter after just a minute and leaving the table. But it always seems to be so dramatic. Staring at Gogue was easier, simpler, and smaller than all that. Yet still powerful. It was an easy connection. Still, you feel each moment, each heartbeat, so intensely. I stood there for a few minutes and wondered how long this might go on. Then a couple of visitors entered the gallery and I didn’t want to monopolize the space, so I stepped away. The Jungle Barbie box is empty. The artist is not present. All art is identity art. Through the practice of Social Production, I hope to make work that is a bit less about the artist and a bit more about empowering participants to explore and express their own identity.